One-of-a-kind. AA Rhodochrosite is one of my favorite stones. It is one of the best heart healing stones, stimulates warm feeling of love, allowing healing for the emotional and physical bodies. Brings you a feeling of joy, positive attitude towards life. Stimulates circulation and blood pressure, kidneys and reproductive organs, helps migraines. One of the stones that help cancer patients heal by not allowing cancer cells to grow. Healer of deep grief and sorrow, and abuse issues. Help heal the physical heart, opens heart and solar plexus chakras. 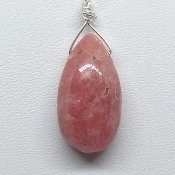 AA Rhodochrosite from Argentina on 16" 925 silver chain. Center stone: 22mm x 12mm x 8mm.